"Put the Power Pack in, but don't tell him that it's a hard job. Just tell him what to do and he will do it ... he won't know it's a hard job." Photos courtesy of: Tim Tucciarone and Ricardo Cabanit. Vic McQuaide’s goal for the 2014 Games is simple. The 45-year-old SoCal native has a history of going for gold—whether as a Gulf War Marine, world champion in sailing or national sprint champion in track cycling—and he has the same big plans for his first-ever CrossFit Games appearance. As a kid, McQuaide played soccer, but was also into road cycling. At 14, he paced second in statewide road bicycling competition. His love for the rush of competition eventually led him to join the Marines at 18. “I joined because I was looking for a higher calling and a chance to test myself,” he said. And a test he sure received in his service, particularly in his last year as a Marine. After leaving the Marines that same year, McQuaide began competitive sailing. That, too, satisfied his physical and mental sides. McQuaide had to be the one both physically and mentally in tune, for he was the crew’s “grinder”—the man manually cranking the machinery, or “winches,” used to keep the sails tight and properly position the wind, often times with hundreds of pounds of force. Nicknamed “Power Pack” because of his strength by his teammates, there was one day the team was struggling with a particularly hard grinding job on the boat. They devised a plan to have McQuaide do the work. “Put the Power Pack in, but don’t tell him that it’s a hard job. Just tell him what to do and he will do it … he won’t know it’s a hard job,” McQuaide mocked in re-telling the story. And so the Power Pack did … for hours. It was only later the team told him his job was usually done by three people. Luckily, McQuaide loved the hard jobs. And test it he did, as McQuaide made it to the top of the international sailing world in two years and competed as a member of the “Stars and Stripes” team for the USA in the 1995 America’s Cup, the World Cup of sailing. While the USA lost the 1995 America’s Cup in the finals, McQuaide continued on to compete in some of the most competitive races in world, and in 1998, he helped win the Maxi World Championships with team Sayonara. However, sailing wasn’t the only sport McQuaide chased championships in, as his next sport of choice was track cycling, which also supported his dedication to his family, as his father, John McQuaide, competed. After McQuaide won a National Championship in 2009 as a team sprinter, both McQuaides won their own National Championships in 2010 at the Masters Cycling National Championships, father in the 2k Pursuit (2000-m Time Trial) and son in the team sprint (3x1 250-m Relay). After succeeding at a high level in cycling, McQuaide began looking for yet another new sport to compete in. After only starting CrossFit a few months earlier—November 2011—at CrossFit Santee, McQuaide was, not surprisingly, eager to compete. He entered the 2012 Open (not yet masters age), and finished 353rd in SoCal. 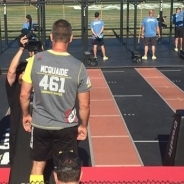 With the addition of the new Masters 40-44 Division in 2013, McQuaide was ready, knowing he had a shot. He had his eye on the next level of the competition. Though he placed 36th on 13.1 for his division worldwide, the following workouts took their toll on McQuaide. For instance, he took 674th place worldwide in 13.3, getting caught in his muscle-ups, eventually only completing two amidst his frustration. Such a blow caused him to finish in 125th place at the close of the Open. So he brought in the reinforcements just as the Open ended. McQuaide’s 17-year-old daughter Allie, and his girlfriend Reese, joined him at CrossFit Santee and proved to be a huge help with his training for the 2014 season. And so the McQuaides pushed for a stronger performance this season. Now in the 45-49 Division, Open Workout 14.1 resulted in an even better performance than 13.1. He completed 8 full rounds of snatches and double-unders, landing him in fifth place. But the fear of a downhill performance like 2013 was in the back of McQuaide’s mind. His vigilance paid off, as McQuaide finished the Open in 17th place overall, and thus was entered into the inaugural Masters Qualifier. Nevertheless, McQuaide proved this was his year. He managed a PR on the clean with 260 lb. for 54th place. And he completed his first Amanda in 8:18 for 33rd place. McQuaide crushed the final two workouts, finishing in a tie for ninth overall and securing a spot to the 2014 Reebok CrossFit Games.